132 Beacon is located on the NW corner of Beacon and Berkeley, with 126-128-130 Beacon to the east, across Berkeley, 134 Beacon to the west, and 149 Beacon to the south, across Beacon. 132 Beacon was built ca. 1861 for David Sears to be the home of his son and daughter-in-law, Knyvet Winthrop Sears and Mary Crowninshield (Peabody) Sears. The son of a merchant in the China and East India trade, David Sears managed his family estate. 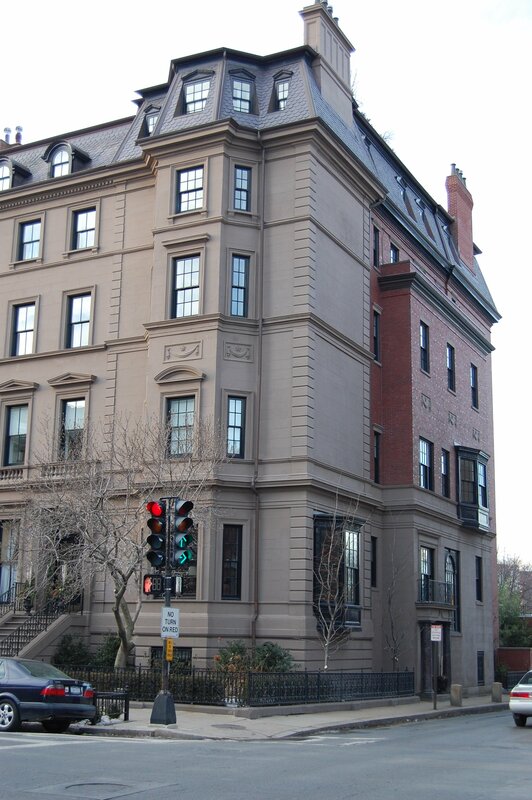 He was an early investor in Back Bay land, having purchased large areas of undeveloped tidal flats prior to the district being filled and developed. 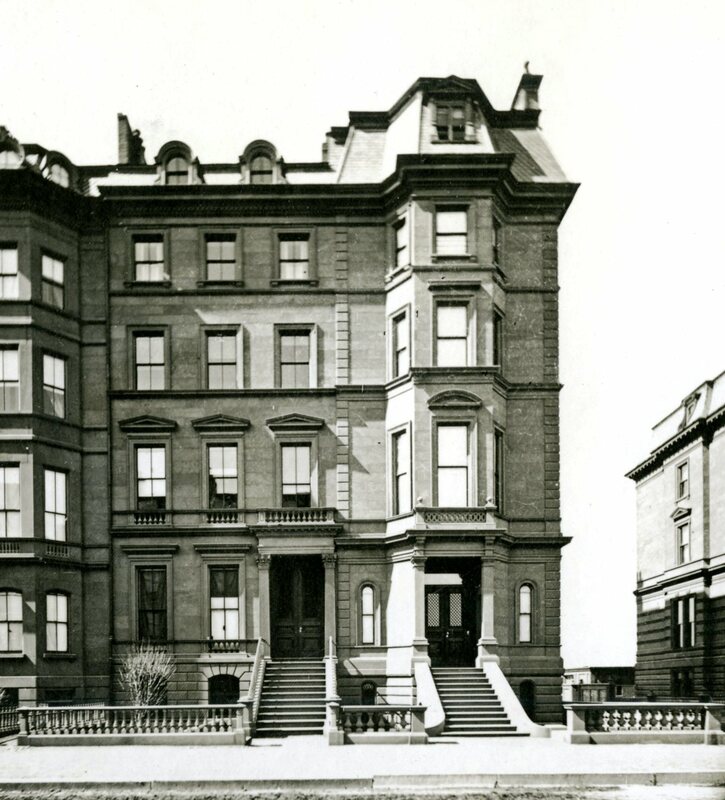 He and his wife, Miriam Clarke (Mason) Sears, lived at 42 Beacon, which later became the Somerset Club. 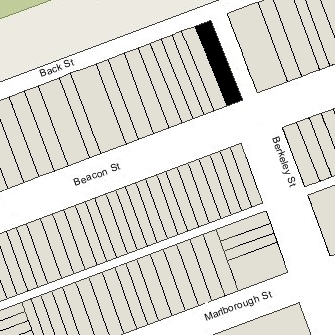 David Sears purchased the land for 132 Beacon on March 20, 1860, from Horace E. Armington, who had purchased it from the Boston and Roxbury Mill Corporation on May 6, 1859. Click here for an index to the deeds for 132 Beacon. 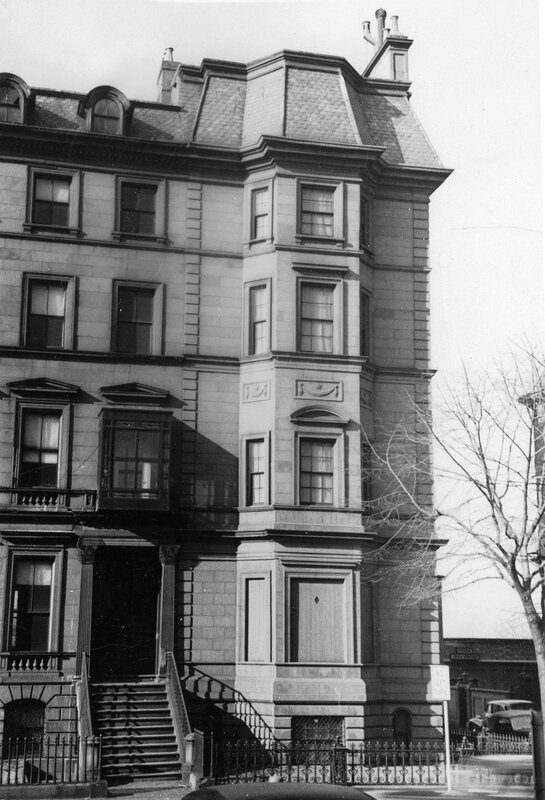 The entrance of 132 Beacon originally was on Beacon Street, reached by a flight of exterior stairs, resulting in a façade similar to 17 Marlborough, where symmetry is achieved by centering the entrance in front of the bay. As originally built, 132 Beacon also had a single dormer window inserted in the center of the mansard on the front bay. On November 2, 1861, after the house was completed, Knyvet Sears purchased it from his father and he and Mary Sears made it their home. While the house was being completed, they had lived at 116 Beacon with Samuel Hammond and his wife, Mary Crowninshield (Warren) Hammond. They also maintained a home in Nahant. Knyvet Sears died in June of 1891. Mary Sears continued to live at 132 Beacon with their daughter, Clara Endicott Sears, an author. Mary Sears died in August of 1929. In March of 1930, Clara Sears significantly remodeled the house, including closing the entrance on Beacon and constructing a new Street level entrance on Berkeley. As part of the remodeling, the dormer window originally located in the mansard was removed, as were the arched windows on either side the former entrance on Beacon. The remodeling was designed by architects Shepard and Stearns. 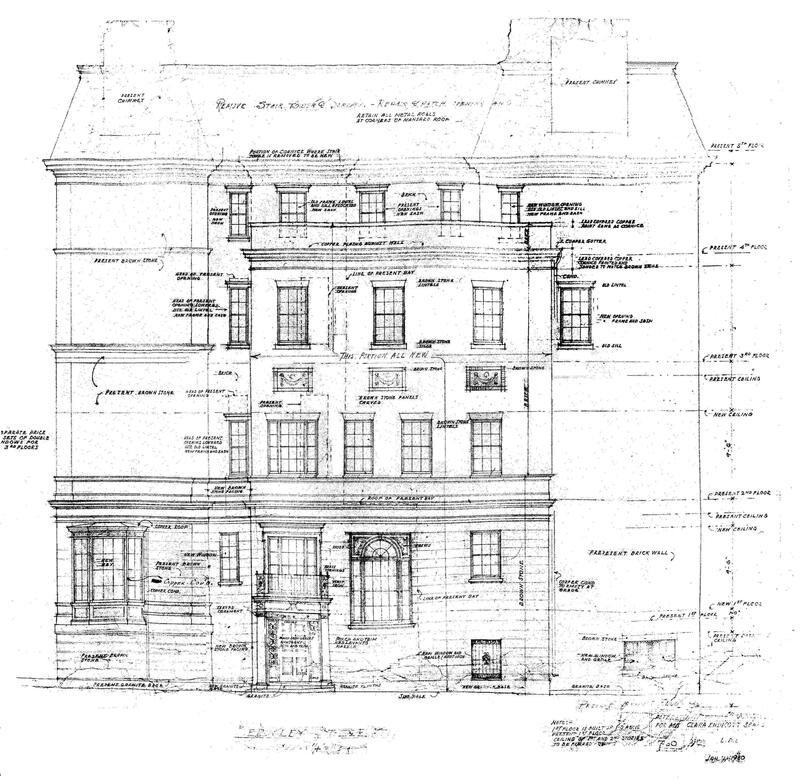 Architectural plans for the remodeling — including elevations, foundation plans, floor plans, and framing plans — are included in the City of Boston Blueprints Collection in the Boston Public Library’s Arts Department (reference BIN P-75). The drawings to the right (courtesy of the Boston Public Library’s Arts Department) are renderings of the Beacon Street and Berkeley Street façades, prepared by Shepard and Stearns in connection with the 1930 remodeling for Miss Sears. Clara Sears continued to live at 132 Beacon until the late 1940s, after which she moved to the Hotel Vendôme. She also maintained a home in Harvard, Massachusetts. On July 16, 1948, 132 Beacon was acquired from Clara Sears by Fannie I. (Itzkowitz/Asquith) Lang, as trustee of the F. G. S. Real Estate Trust. She was the wife of Clarence E. Lang, a real estate dealer. In the 1930s, she had operated the Fannette Gown Shop at 85 Newbury. In November of 1948, Clarence Lang filed for (and subsequently received) permission to convert the house from a single-family dwelling into twelve apartments. It probably was at this time that recessed dormers were added on the front and sides of the bay in the mansard and that two additional recessed dormers were added on either side of the bay. In August of 1953, Fannie Lang filed for (and subsequently received) permission for a one story addition at the rear of the building, increasing the number of units to thirteen. 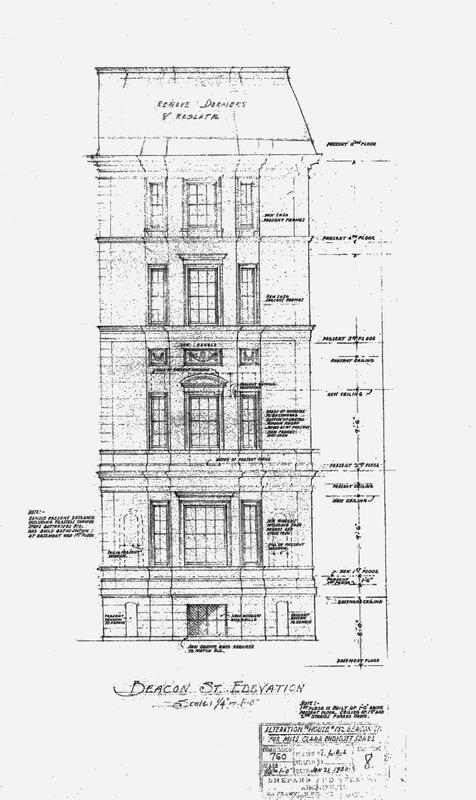 Architectural plans for the addition are included in the City of Boston Blueprints Collection in the Boston Public Library’s Arts Department (reference BIN R-150). On August 31, 1962, 132 Beacon was acquired from Fannie Lang by Emerson College. In October of 1962, it applied for (and subsequently received) permission to convert the house from thirteen apartments into a men’s dormitory and one apartment. In November of 1964, Emerson College acquired 134 Beacon, which it converted into another dormitory. On November 15, 2006, 132 Beacon and 134 Beacon were acquired from Emerson College by Beacon Street Development LLC (Harold Brown, manager of record). In December of 2006, it filed for (and subsequently received) permission to remodel the property and change the occupancy from twelve apartments to eleven residential dwelling units. In March of 2008, it modified the plans to reduce the number of apartments to five. On October 23, 2008, it converted the property into five condominium units, the Riverside Condominium. 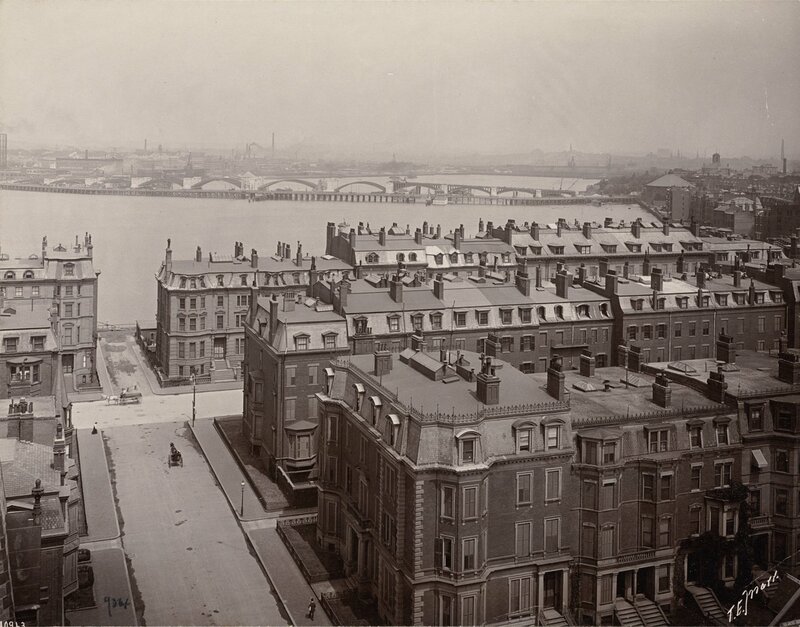 The photograph below (courtesy of the Print Department of the Boston Public Library) shows 132 Beacon and its neighboring houses on Beacon and Berkeley as they appeared ca. 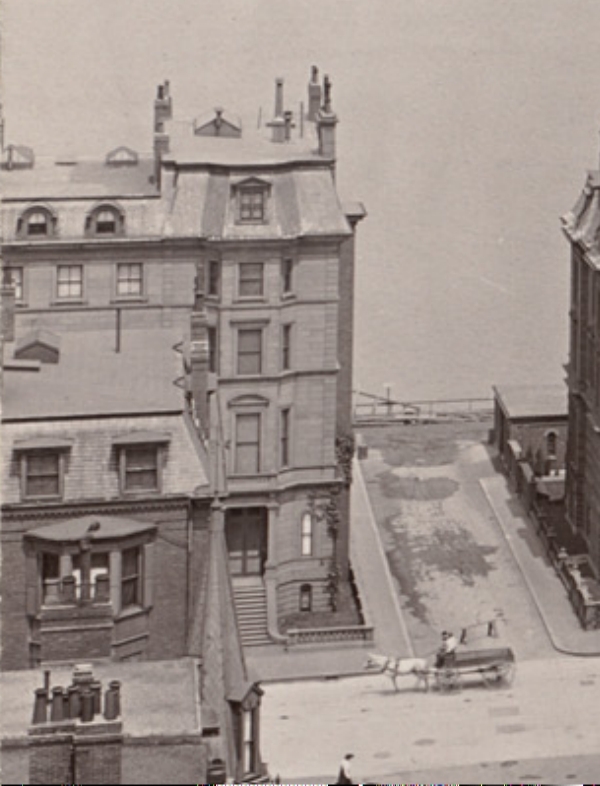 1900, probably taken from the top of Haddon Hall at 282 Berkeley, which was built in 1894.